Post news Report RSS	Sale on the mobile store! Our Discouraged Workers TEEN version is currently on sale in the mobile store! I am Lee Yunseok, creator of YGGDRASIL STUDIO. 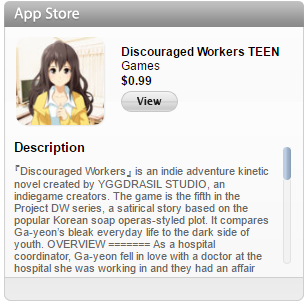 Our Discouraged Workers TEEN is currently on sale in the mobile store. You can grab our TEEN version at a discounted price on the App Store and Google Play!